Autumn is a time for relaxation, for cooler weather, and for enjoying the brilliant and colorful spectacle of Mother Nature as she prepares for her long winter’s rest. Autumn is the season for holidays, for spending time with family and friends, for giving thanks and for feasting on the fruits of the year’s harvest. To get you in the mood for fall, we’ve mixed up some new essential oil blends (and polished up a few traditional favorites!) that will bring all of the wonderful scents of the season into your home and office. Simply drop the essential oils listed in each blend into your diffuser (not got one? Check out this review of five of the best!) along with 70 ml of water and enjoy! Need any of the essential oils mentioned in this article? The best place to get them is from Plant Therapy Essential Oils at their official website here. This blend is inspired by the scents of walking in the woods in autumn – of damp leaves and moss underfoot, and that first breath of crisp cool air that carries with it just a hint of winter. I highly recommend using Birch oil in this blend, however you can substitute Wintergreen for a similar effect. This blend is a warming mix of sweet and spicy, like candy for your nose. Our take on the traditional autumn blend provides an immediate infusion of bright orange aroma followed by the gradual build of cinnamon and clove. The spices linger in the air long after the orange scent fades. Less fruity and more earthy than citrus spice, this blend is best with a smooth and somewhat mellow patchouli as this will be the scent that lingers longest after you turn off the diffuser. Also similar to citrus spice but with an interesting twist, this blend recreates the sweet aroma of a traditional English pomander. This subtle earthy blend will fill a large room within seconds, but it isn’t overbearing. Perfect for holiday parties or to set a relaxing mood for unexpected guests! This blend was inspired by a late November weekend spent in a log cabin in the mountains. Mingling scents of cedar and evergreen mixed with hints of soft mint create the olfactory illusion of a crisp autumn morning under the boughs of an alpine forest. If you love to warm up with a cup of hot chai on a chilly autumn morning, this blend may very well become your new favorite! Nothing says autumn like a generous slice of pumpkin pie. This blend of warm spices is perfect for winding down at the end of a long day or for snuggling up with someone you love in front of a crackling fire. This blend of immune-boosting essential oils works wonders for clearing the sinuses and warding off autumn colds. Also great for a quick pick-me-up on a slow morning! All of the above blends were created and tested using both a Deneve Riverock diffuser and a ZAQ Dew LiteMist diffuser, and two noses (one expert, one not-so-expert). While we think they’re just about perfect (the blends, not our noses), you may of course disagree. For this reason, we encourage you to experiment with our blends until you find the mix or mixes that are perfect for you! Our “go-to” supplier of essential oils is Plant Therapy Essential Oils. They offer 100% pure oils wit no additives or adulterants and always at affordable prices. They have a huge selection, an easy-to-use website, fast and free shipping and free returns if you aren’t happy. You can browse their essential oil collection (and find every oil mentioned in this article) at their official website here. Also, be sure to check out our 50 Aromatic Essential Oil Recipes You’ve Got To Try In Your Diffuser for more essential oil goodness! Don’t Fancy Making Your Own Fall Blends? Then this set of “Fall Blends” from Plant Therapy is for you. Including three bottles of Autumn goodness, such as Spiced Orange, Autumn Breeze and Pumpkin Pie. 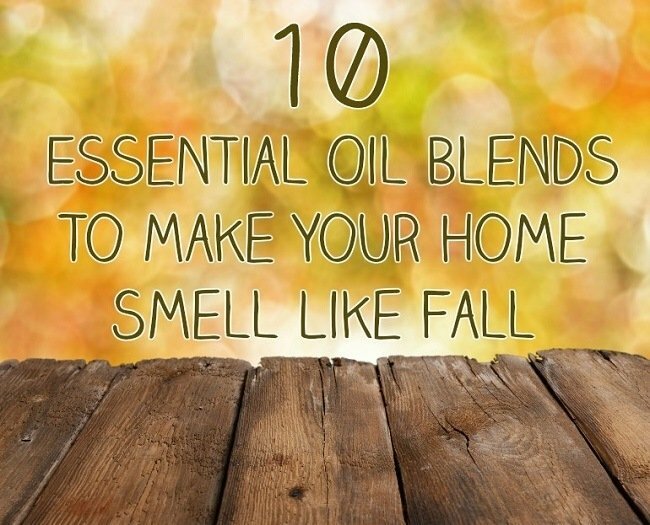 Simply add a few drops to your diffuser and perfume your home with the wonderful aromas of Fall. Get more details and order your Fall Blends collection here.